This post could also be titled "How to make your husband love you forever." I don't typically participate in Really Random Thursday at Live A Colorful Life but always enjoy reading it. Today I have a really random sewing project to share and show. My dear husband uses a lot of pillows and not too long ago he bought himself a travel sized pillow to use between his knees. Since then he's had it in a regular sized pillow case which is two times too big. 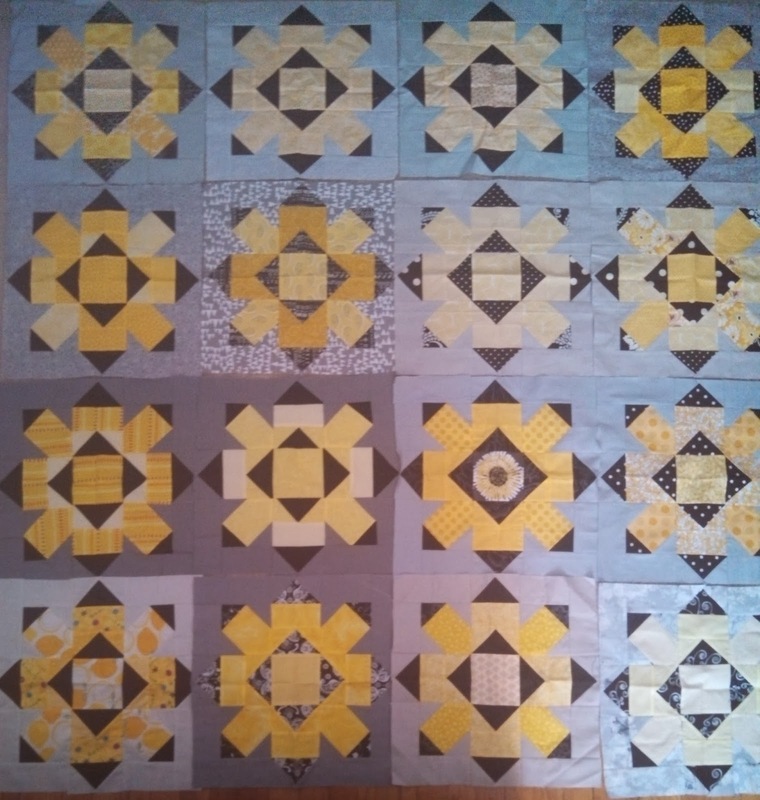 Fast forward to me working on FMQ-ing my 2013 Stash Bee Quilt (that I don't think is going to get done this month, boo!). I always test my tension on scrap fabric and batting sandwiches and the fabric I was using was from a piece of Thomas the Tank Engine fabric and when my husband saw this he went on and on about how much he loved Thomas when he was a kid. So using the travel pillow as a guide, I cut two rectangles of fabric and made him a pillowcase that actually fits the small pillow in less than 15 minutes. The stripe on the back is actually a coordinate in the line that the Thomas and friends print is from so it matches perfectly! My husband was very excited and wants me to make him a second one for when this one is in the wash. 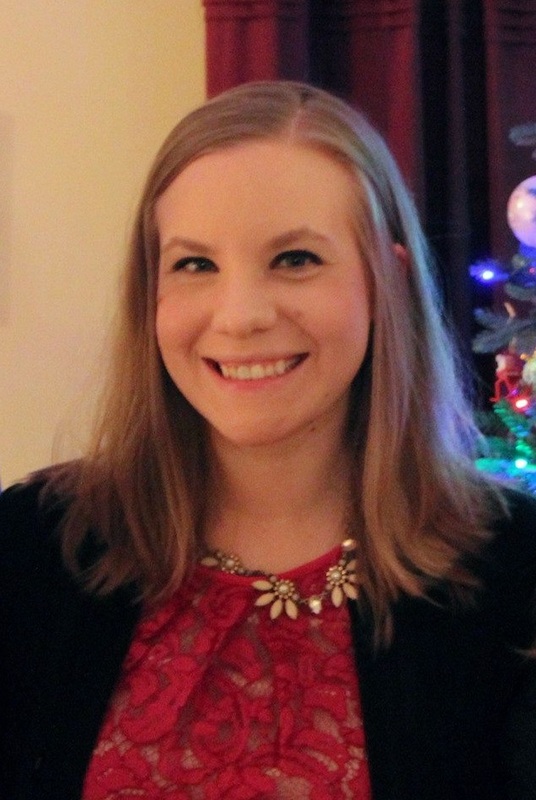 Sharing my silly story at Really Random Thursday! I finally got the extra yard of backing that I needed for my 2013 Stash Bee Quilt! I forgot to take a picture of the backing before I layered and pinned the quilt, so I'll add one in the finished post. I have made an effort to quilt this one larger than I quilted the Churn Dash Baby Quilt but it still seems like my FMQing is very small in scale. It's bigger than the near-microstippling that I did prior, but it is still pretty dang dense. It's hard to see the quilting in some of the fabrics that have a lot of white in them or have white backgrounds themselves! Thus far I've only had one little edge section that I had to redo because the backing had folded over on itself but that took no time at all to fix! I'm just glad I caught it before it got worse. At this point I am about half way done! The center-most 4 blocks are all done and about half of the next ring of blocks is more than half done. It seemed to me that the blocks on the edge went a little faster the first time around because of not having to shift around the entire quilt all the time. I might just be able to finish this in the next three days and meet my February ALYoF Goal! Sharing at Linky Tuesday, Fabric Tuesday, and WIP Wednesday! PS. Don't forget to vote for the first block in the QCQAL and link up your fabric pulls for your blocks! Today we're going to talk about what fabrics we're using in our QCQAL blocks. 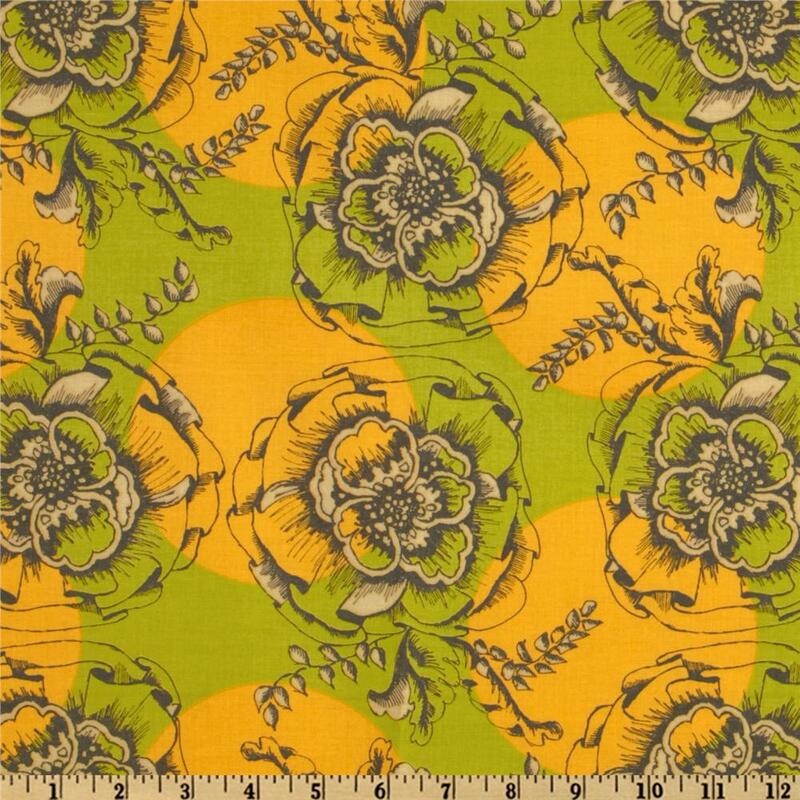 I was a lucky duck and won an amazing fat eighth bundle of Clover Sunshine from Llama Fabrics on Etsy. It's so gorgeous I could just giggle for days. For my background I am going to use Kona Champagne. I'm planning to use all of the fabrics at some point and mix them up as I go. Any leftovers will be utilized in some sort of a pieced back. A few fabrics will be better suited for some larger piecing blocks than for small piecing (looking at you, Kite Tail prints!). Amanda has some of the fabrics from the Chiffon line from Free Spirit that she plans to use and then add in some fabrics from her scrap stash. Still shopping? 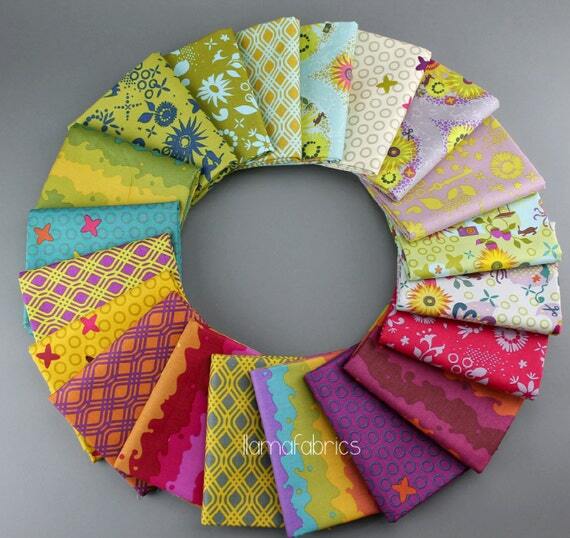 BobbieLou Fabric has a build your own bundle option. With flat rate shipping to boot! Want to show off your fabric pulls? Add your link below! Since I'm at an impasse with my Stash Bee Quilt (waiting for more backing fabric to arrive) and my Double Hourglass quilt (need to go shopping to find border fabric), I decided to pull out a WIP that I hadn't touched since JULY. Needless to say, I didn't get my ALYoF goal completed that month! I now have 15 more blocks to go now! When I had originally made the pairs of all of the jelly roll strips for the first half of the blocks (you get 2 blocks per strip) I intended to repair all of the blocks with another fabric to make all different blocks for the second set. Since I'm making a tiny effort to simplify my life, I decided to just make the blocks in pairs. Of course, now I realize that I will have two quilts that are plaid like in nature -- this one and my Stash Bee quilt -- but since this one is a Christmas quilt, I can be okay with it. Linking up to Linky Tuesday, Fabric Tuesday, and WIP Wednesday! Don't forget to go vote for the first block in our Quilter's Choice Quilt Along! Voting is open until March 3rd, and right now the Sister's Choice block is winning! 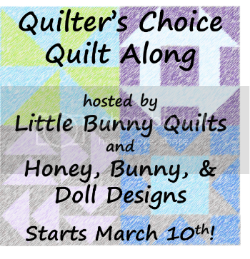 Little Bunny Quilts and Honey, Bunny, and Doll Designs are hosting a new kind of quilt along where all of the blocks will be chosen by YOU, the participants! 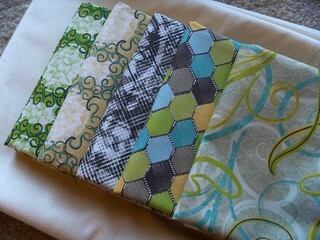 Each one of you will have a hand in choosing each one of the 12 blocks in a HBD Design's first sampler quilt! Every two weeks a new block pattern and tutorial will be posted here on the blog. At the same time, a new poll will be posted for you to vote on the next block! Since even we don't know where these blocks will go, we've built in a good cushion for you to make sure you have enough background and piecing fabrics! Not interested in making a throw quilt? Make the blocks along with us and add them into another sampler project! We'll be making 12 inch finished blocks so you can mix them in with other 12 inch blocks that you might have from other bees, swaps, and QALs if you want to make something other than our 12 block sampler! It won't hurt our feelings, we promise. Have an another block you'd like to see as a candidate for the QAL? Leave suggested blocks in the comments section and it might end up on the next round's voting list! Our schedule is on the QCQAL page. Check there for the latest posts and polls. There will be a block link up every two weeks to share progress! Add your blocks to our Flickr group too! We would love to involve other businesses in this project! If you're interested in sponsoring a give away let us know! We'd love for a few fabric shops to join in and share what fabrics they'd be using in this project! Hive #3's queen bee for the month of February is Em from Sewing by Moonlight! If you don't follow her blog, you should, and she's one of my favorite Instagram accounts right now. She is working on a star quilt with green, teal, and blue with an oatmeal background and gave us free reign to make whatever kind of 8, 12, or 16 inch stars we desired. I made five 8 inch stars because Em mentioned that she'd likely be needing more small stars than big stars for the quilt. Haven't been able to get them in the mail just yet, but I will on Monday! No, I am not just making my January blocks now! I am the Hive Mama for Hive #3 for the new round of the infamous Stash Bee! This time around, the Hive Mamas all had January as their month. I chose to use a block I found in the Quilter's Cache called Firewheel. Since I didn't want to make the block entirely out of half square triangles myself, I decided to rework the pattern to include fast flying geese, which you can find in my tutorial over at the Stash Bee. And as of yesterday I've received all of the blocks but from one person and here they are! I am so excited to put this one together! I definitely love making these bigger blocks and will be making a few more using big blocks in the future for sure! I love to strip piece and I had been stashing two mini jelly rolls in aqua and orange. My mom gave me the two that she had that were the same so I had enough to make a twin sized quilt. I decided to use Allison's double hourglass tutorial as inspiration for these blocks and went through a pattern of sewing and cutting and sewing again until all the strips were turned into blocks! Once I finished all 80 blocks I separated the blocks into 4 piles and made identical "quadrants" for the upper left lower right corners of the quilt. I've spent HOURS on some quilts making the blocks "random" and I just don't have the time or patience to do that anymore. If someone realizes that the sections repeat, I will give them a prize. The other two sections I put together individually without matching because it was easier to make sure that the same colors weren't next to one another or all in a cluster. Here's 80 blocks all sewn together! 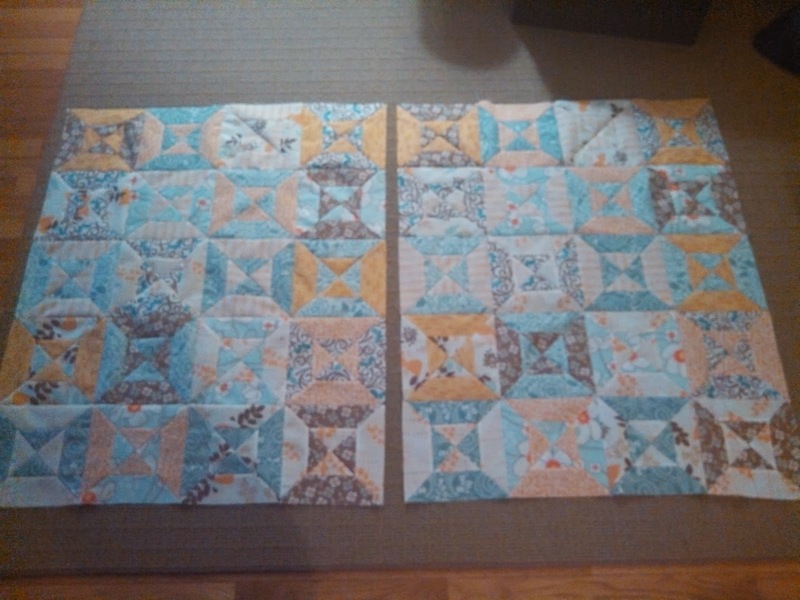 The top is the right width for a twin sized quilt but it is a touch on the short side so I will need to add a top and bottom border to get it to the correct size. Once this quilt is finished, I am going to donate it to the sorority I advise to raffle off to raise money for our literacy philanthropy. It's about time I put my quilting addition to good use! Sharing over at Linky Tuesday, Fabric Tuesday, and WIP Wednesday! For my Lazy Sunday Mystery Quilt, I decided that I didn't want to make the borders as directed. Too many stitch and flip triangles (also known as, too much waste!). I decided that I wanted to use fast flying geese instead and came up with a really fun border idea. Maybe someone else already thought of this, but I'm super proud of myself for figuring this out and figured I should share. Scared? Don't be! This whole border is entirely flying geese! The clever part of this whole thing is color placement. I'm making my borders with goose units that are 2" x 4" finished (2.5" x 4.5" unfinished). This can be found all over the internet, but it bears repeating. Draw diagonal lines down each of your "background" squares. Line up two of your background squares along one of the diagonals of the goose square. Sew 1/4" away on each side of the line and cut along the marked line. I use scissors so I don't have to walk over to my cutting space. Iron background triangles away from your goose triangles. Line up your remaining two marked background triangles, one on each of the cut halves, with the remaining 90 degree corner. Again, stitch 1/4" away from each side of the marked line. Cut part along the marked line. Iron background triangles away from the goose triangles. Trim off dog ears and gaze in awe at your amazing four finished flying geese. For each chevron unit, you need oppositely colored flying geese. I called the light peach my "background" and my orange (or pink) fabric as my "chevrons". To make each chevron unit, just sew together along your "chevron" fabric so that both geese point in the same direction and the colored background from one goose unit connects to the colored goose triangle of the other goose unit. I had to use two different fabrics to have enough to have a border all the way around my quilt. For the most part they alternated pink, orange but I had to sneak in a few more pink units because I ran out of orange! To attach it to my quilt. I just added goose units until it was equal to or ever so slightly longer than the side of the quilt that I was working on and eased if necessary. This is one of my first forays into pieced borders and I think it turned out pretty nice! Obviously, accuracy is key in making sure that your borders fit your quilt correctly (and that one side isn't inches longer than the other!). This would be a really fun addition to a medallion type quilt as a skinnier border separating rings of blocks, I think. Tuck this one away in your hats for a future project! 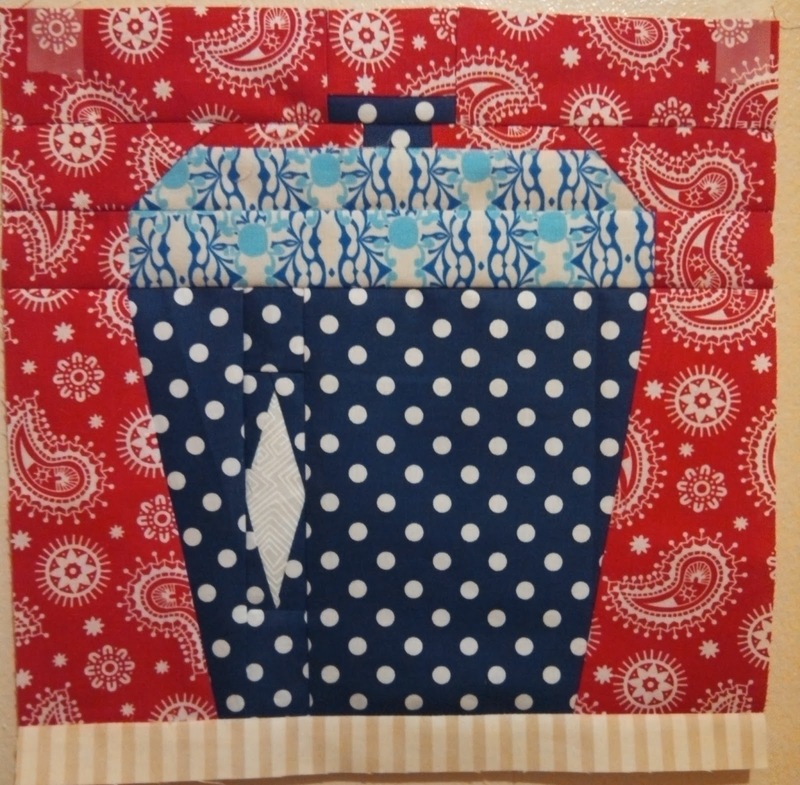 February's block for the Sew Kitschy Sew Along with Kristy at Quiet Play is a cookie jar! I had about a fat quarter left of the navy blue polka dot fabric from the churn dash baby quilt so I decided to use that for the jar portion and to go a little wild and use red paisley for the background. What I would like to do is either a) find someone with an embroidery machine that can stitch "cookies" in yellow on the jar or b) machine applique on a yellow cut out of "cookies" onto it. Sharing my block in the monthly link up! Still lots of time to join in! 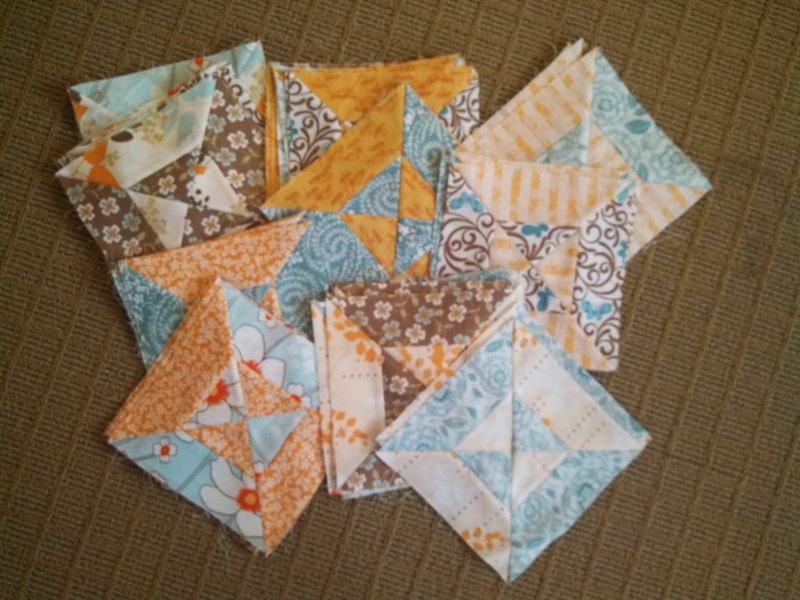 The second block for the Fat Quarter Shop Wishes Quilt Along is now available! 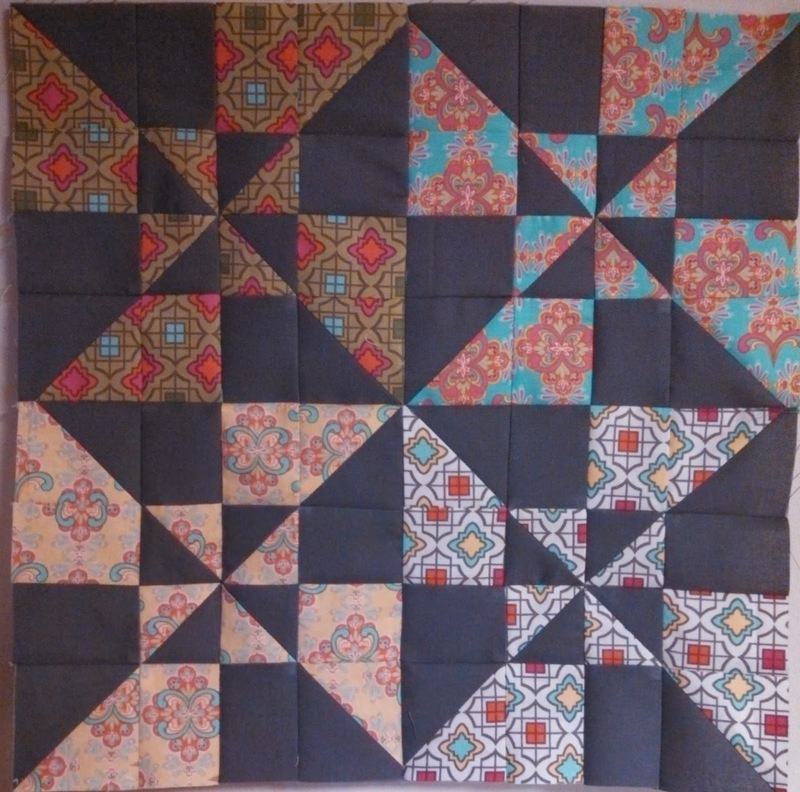 This month's block is called "Double Windmill". 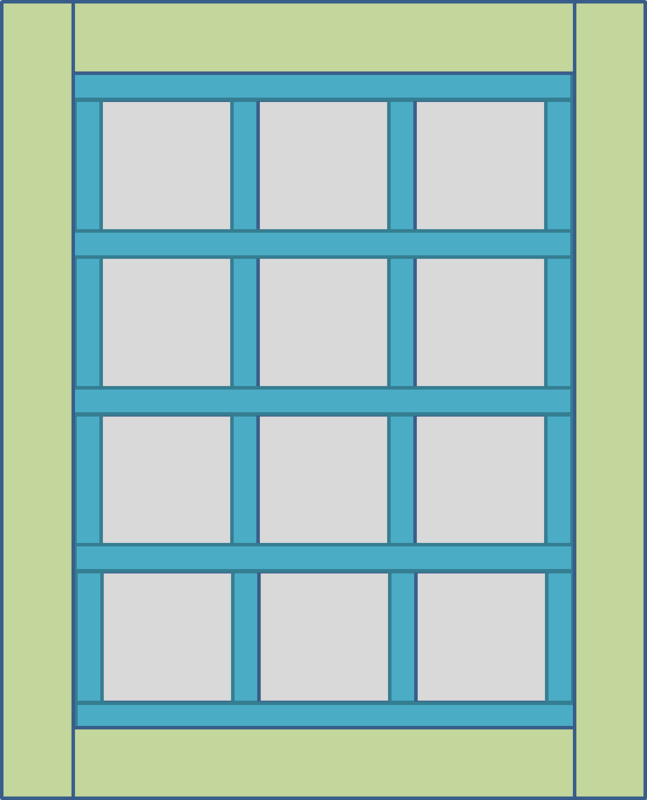 Here's my block which I made last night! For February, I'd like to finish my Stash Bee quilt from last year! I am going to keep it square and it will end up 60 inches square. I will probably add in the leftover blocks on the back as well. As far as quilting this one goes, I think that I will do some sort of large swirls or loops -- certainly nothing like my micro-meandering! I am so glad you came to visit and see what I've been up to lately! Want to chat? Email me at littlebunnyquilts@gmail.com! 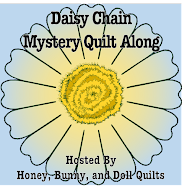 Daisy Chain QAL -- JOIN IN! I'm A Moda Bake Shop Chef! Click to see all my Moda Bake Shop patterns! ALL MATERIAL ON THIS SITE IS COPYRIGHT 2011-2019 ALISON M. VERMILYA/HONEY, BUNNY, & DOLL QUILTS AND MAY NOT BE USED WITHOUT PERMISSION. Pictures may be freely pinned on Pinterest and sharing of links is encouraged but please contact me if you have questions about sharing MY content. F is for… Typecast of Characters Blog Tour! Modern Plus Sampler ++ Parade and Prizes! Design by Jennie Renee. Theme images by Ollustrator. Powered by Blogger.